With frequent climate change, exposure to pollution, having baby' with little or more mucus is quite common these days. No matter how much you take care of your baby's health with strict hygiene factors and so, but still infants are prone to have nasal congestion. Though my child is summer baby, but frequent cold sure to temp change use to lead her having blocked nostrils. Hence, she use to have sleepless night when she was infant and uncomfortable and irritable sleep as she grew. There were times when she use to get so annoyed as blocked nostrils was interrupting her to feed breast-milk comfortably. I shared with my mom, she somehow asked me not to bother, she claimed that she will sniff out on her own, or i can try removing it after giving her warm bath. Firstly, she was too young to sniff mucus out, secondly I was too scared to touch or insert anything in her nostrils. Yes I use to use warm washcloth to squeeze the mucus (note. not inserting anything in nostrils). In fact her pediatrician also suggest to give feather touch massage with fingers died in warm water from eyebrows towards nose running down slowing over nostrils. It did work , but too difficult to do with baby with high reflexes. 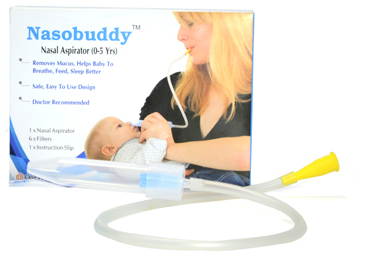 Recently I received 'Nasobuddy' -Nasal Aspirator (0-5 years) for product review. How I wish I knew about Nasobuddy during those days! It's better late than never as Nasobuddy can be used by infants upto 5 years. Hygenic filters provided in kit will prevent mucus to transfer from child to user. Easy and light weight. So quite convenient to carry it on-the-move. Easy to wash and clean the aspirator pipe and other attachments. filters are disposable. It does not require hot water sterilization(as the product does not go inside baby's nose) . The yellow mouthpiece (used by the parent) can be wiped with spirit if required. Easy to use, no complication in assembling or geeting things right, it an handy-man for busy mom for quick fix of blocked nose. It's BPA Free :-) Am a pro-glass and steel mom, I do recommend this product as it's BPA free. Nasobuddy comes with a Nasal Aspirator (nasal Suction Tube and sucking pipe, attached yellow mouth), 5 Extra Hygienic filters and an instruction manual. Yes, a separate 10nos Nasobuddy filter pack is available. Price on request. Mom-says: I have given one star less, despite the fact I loved the product. But sometimes it's too much taxing to keep sucking speacially with hard mucus. I recommend if there can be any automation, to easy the manual hardwork. I would not know the the technicality and medical challenges. See if some more modification can be done. The best part is my lo loves using it, not sure beacuse it's something new for her, but happily she allows me to clean her nostrils with Nasobuddy. From Company official Website: Infant nasal congestion is common and often occurs in newborn babies, or later due to colds or allergies such as hay fever. Your baby may have around 6 colds in their first year. Babies are “obligate nasal breathers”, which means that they naturally breathe through their nose and when their tiny nasal passages are blocked they find breathing a problem, this is particularly an issue for newborns when they catch a cold. In fact, the only time babies breathe naturally through their mouths is when they cry!